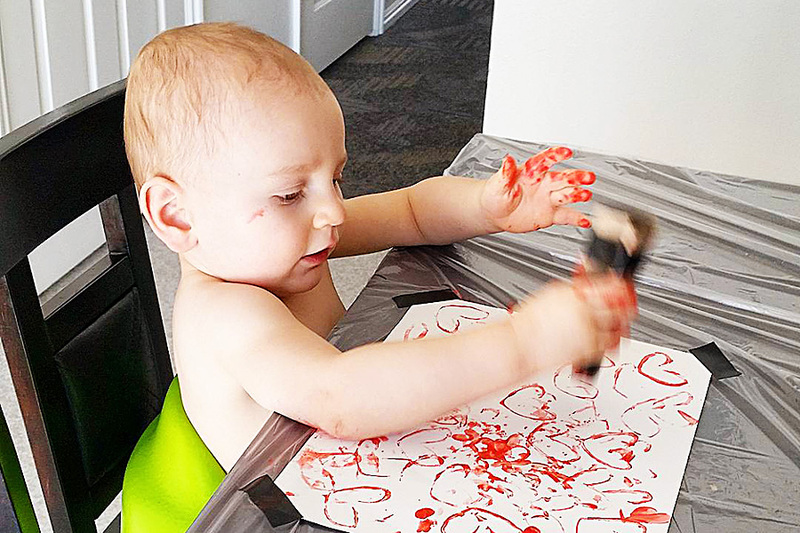 Think your baby’s too young for crafts? Don’t underestimate him (or her!). Alex is just over one now, and he loves doing crafts with me. The key is to think super simple, and just let it go when it comes to the mess. Alex has a bestest bud in the whole wide world – Cameron, age one as well. 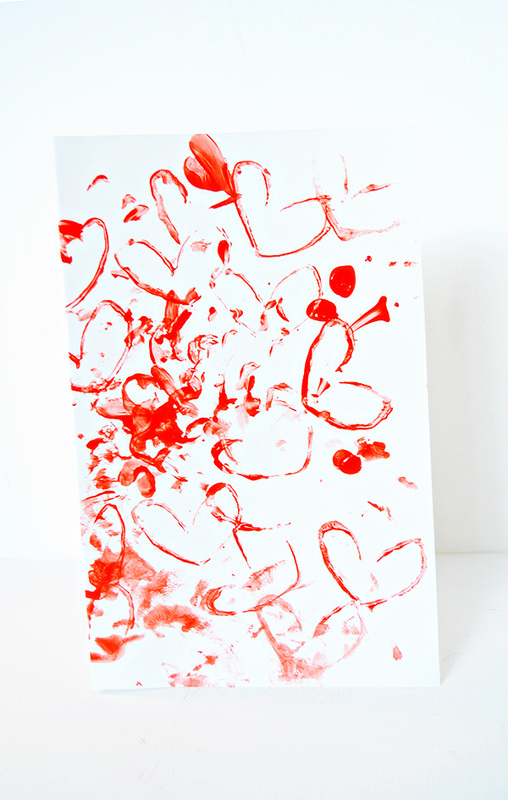 His mom and I got together and did two way easy Valentines crafts with the boys. It got messy, but it got fun as well, and I’m planning to keep the products forever because they’re pretty dang adorable! The first one was my favorite. This is the toilet paper tube heart project going around Pinterest. Basically, you take a toilet paper tube and crease it in the center so it makes a heart shape. You can hold the creased tube in shape with tape or a rubber band. 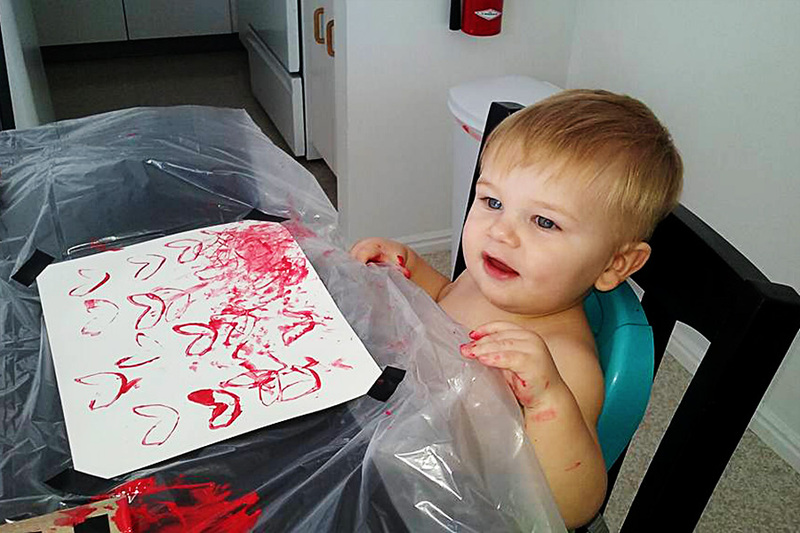 Then, you put out a pool of paint, smear the end of the tube with the paint, and let the little one go to town! 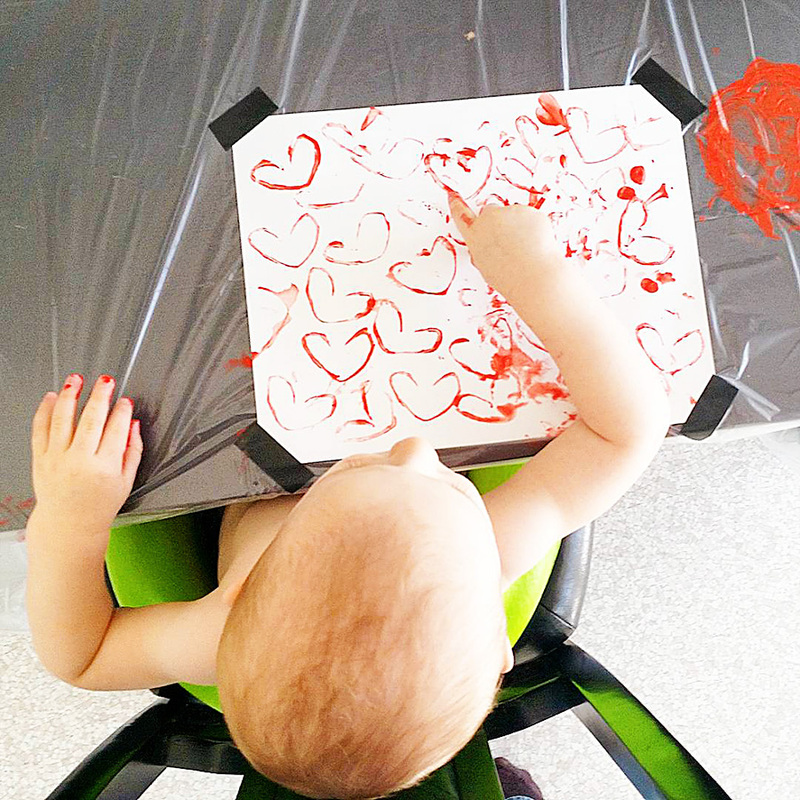 We taped the paper to the table to keep little hands from ripping and tearing, and we used cardstock, which is a little thicker and can take a beating. I definitely recommend non-toxic washable paints for this. It was all I could do to keep Alex’s hands out of his mouth, and by the end of the project, both boys were wearing a LOT of paint. 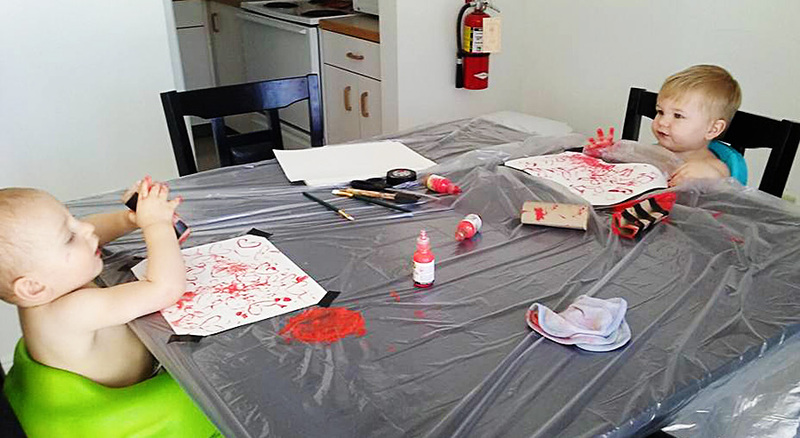 We also used a plastic sheet (Walmart painting section, 89¢) to cover the table and floor, which turned out to be a good choice. Mom supervision was a definite must, as was adorable pictures of the whole thing. Just two boys painting away. This is the final project. 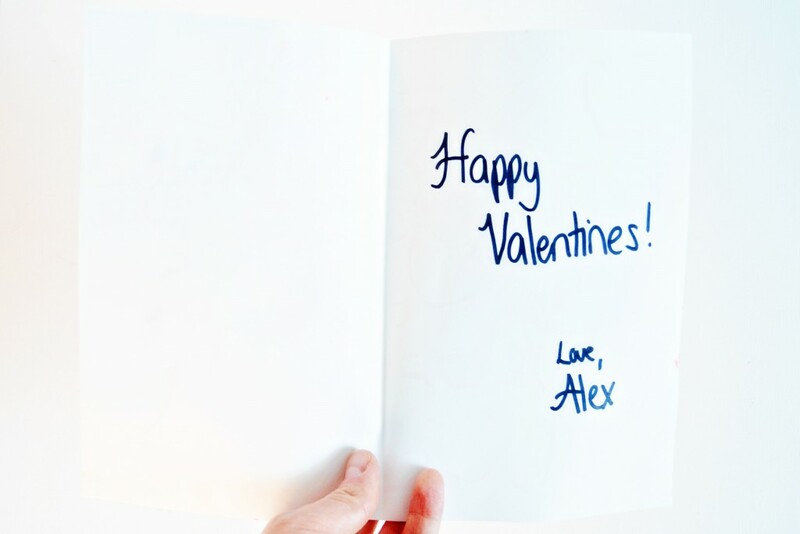 I creased it like a card and wrote a little message inside. 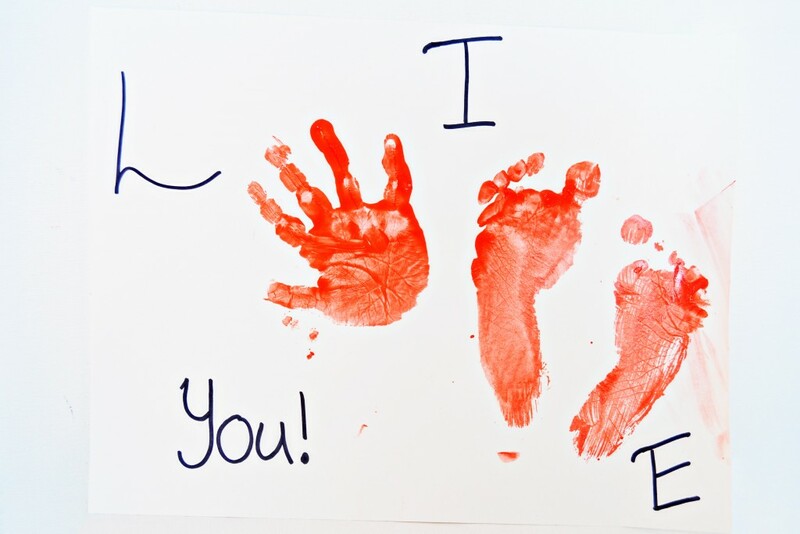 Basically, you paint the baby’s hand and put it in place of the O, and both his (or her!) feet for the V. This is harder than it sounds when the baby is squirming. Originally, I was shooting for a more boxy look, but reality set in when Alex refused to put his hands where I wanted them. Anyway, Cameron’s mom (Gayle) painted Alex’s feet and hand and helped me press them down while I held the little guy, then we switched. 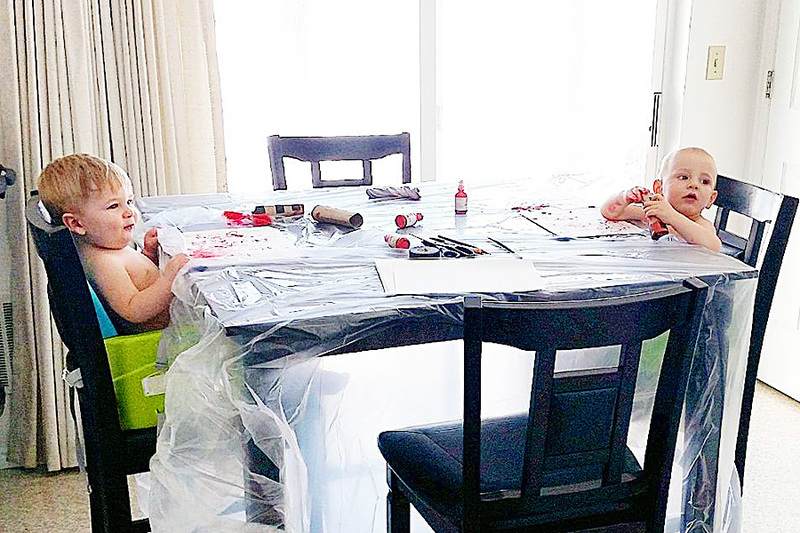 There are no pictures of this because both adults were involved in holding and painting, so you’ll have to imagine how cute this part was yourself. The moms wrote the rest of the message (obvi). And then it was time for the tub. Two adorable crafts? Check! Memories made. Double check! 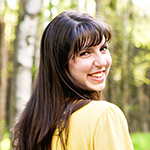 One more picture, ’cause it really was cute! Have you done any crafts with your kids? How did it go? Share your ideas in the comments below!